Welcome to the BrightLocal SMB Internet Marketing Survey 2013. Through this piece of research we aim to better understand the attitudes & usage of ‘Internet & Mobile Marketing’ by small & medium sized businesses (SMBs). This research was conducted in partnership with ChamberOfCommerce.com and we thank them and all participating businesses for their time & assistance. Without them this survey & insights would not have been possible. Please note that these are the survey results for 2013, and that there is a more recent 2014 survey available to view. In October 2013 we contacted 20,000 US based businesses and asked them to participate in the survey. We received 668 responses from businesses spread across over 50 Industry Sectors. The first explores the current scale of internet marketing amongst small & medium businesses, what works for them and their opinions on how this might change in the future. The second part explores how many SMBs use internet marketing consultants and agencies and how effective these working relationships are. The following set of slides are the complete findings from the survey. We will be producing industry specific reports in coming weeks; it you want to get this Industry Specific data first then please Register Here and you will be notified as soon as they’re available. The 2013 survey is the first wave of this survey which we intend to repeat on an annual basis. 1. 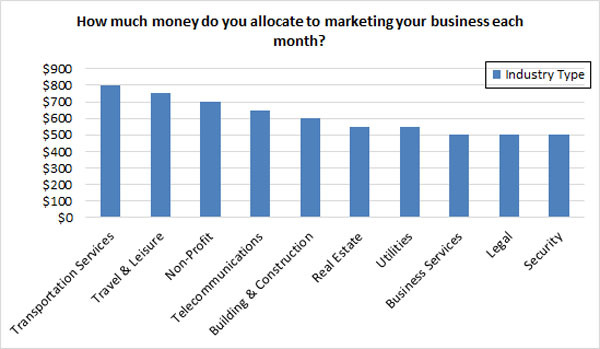 How much money do you allocate to marketing your business each month? 2. What percentage of your marketing money do you spend on internet or mobile marketing? 3. In the next 12 months do you plan to increase the money you spend on internet marketing? 4. Which of the following marketing channels are most effective at bringing you new leads & customers? 5. How effective is internet marketing at attracting customers to your business? 6. Do you have a mobile ready / mobile optimized website? 7. Do you think mobile & mobile marketing is important for the future of your business? 8. Do you handle internet marketing yourself or use a freelance marketing consultant/agency? 9. How do you rate the performance of your marketing consultant/agency? 10. How many times per week are you emailed/called by an internet marketing or SEO company wanting to sell you their services? 11. Which of these statements best applies to your attitude towards internet marketing? 12. If you use/were to use an internet marketing consultant which of these factors are most important to you? 13. Which of these statements best applies to your feelings about Google Places/Google Local? This question helps us to identify what kind of resources small & medium businesses are putting into their marketing each month. The average spend across all industries was $400/month with 32% spending less than $100/month. We also asked respondents to state what industry type they operated in. Looking at the ‘industry specific’ graph below we can see the types of businesses that are spending more than the average amount. There is clearly not a great deal of budget being spent on marketing by SMBs. We know that SMBs have limited budgets compared to larger organisations but are they being held back by other factors such as doubts/scepticism about the results? Or perhaps it is a direct effect of the current financial climate? From the perspective of a marketing agency or consultant, the stats don’t necessarily make attractive reading. However breaking the results down to an Industry level we can see that some sectors have greater spend & bigger budgets. Smart agencies can use (& other sources) to pinpoint more lucrative sections and tailor their offering to them. We’ve established which types of business are putting more of their budget into marketing, but what percentage is being directed towards internet and mobile marketing? Amongst small and medium businesses across all industries, the average allocation is 46% is budget spent on internet marketing. Once again, in this question we isolate the top spending industries in the second chart below. A relatively high proportion of SMBs (33%) are barely engaged in internet & mobile marketing. In fact, with an average of 46% – most SMBs are spending less than half of their marketing budget on these channels. Perhaps it’s the case that many SMBs consider offline marketing to be more effective. Certainly word of mouth & more traditional print marketing have been historically important for small businesses – but it’s somewhat surprising how many of them are choosing to ignore the clear opportunities & benefits of digital channels. Is it the case that many SMBs believe that internet marketing simply doesn’t work as a model for their business? Building & Construction, Transportation & Telecommunications sectors have some of the highest marketing budgets as well as higher allocation of budget to digital. Other industries remain less convinced by opportunities of online marketing. The Travel & Leisure industry appears to be one of the biggest spenders on marketing, however, that industry doesn’t feature among the ‘top 10 online marketing spenders’. Can we draw the conclusion that offline marketing is a particularly effective channel for the Travel & Leisure industry? Certainly from an SEO perspective, travel is an extremely competitive industry – with some very big brands to compete with – but perhaps many companies find that more visual media, i.e. print, television, and other offline marketing works just as well. Non-Profit categorized SMBs are also spending above the industry average on their marketing, but similarly their online spend is not as high. Again, is the Charity & Non-Profit sector one that lends itself to offline marketing methods? Perhaps it is the competition faced against some of the bigger brands in these industries. Or it could be the fact that the online ROI is simply not as appealing for these companies. Another possible conclusion is that the wide range of internet marketing methods available can be a confusing minefield for SMBs within these sectors. Does the thought of getting to grips with PPC, SEO, social media, display, local directories, PR, local SEO and other avenues, essentially put off those companies without the necessary expertise from embarking on an internet marketing campaign? A considerably large 79% are either unsure, or are not planning to. We’ve seen above that SMBs are spending a relatively small amount of their marketing money on internet and mobile marketing (avg. 46%). We can now see that those figures are unlikely to grow significantly in the next 12 months. Some businesses are content with their current marketing mix and see no need to shift more towards internet/mobile. But with growing audiences across all digital platforms, greater smart-phone penetration and ‘epic’ projections for mobile search that just 21% of SMBs plan to spend more next year. A large swath (47%) are fence-sitting while they watch how the economic climate develops. They are prudently not over committing themselves but we might expect a more positive outlook given recent up tick. This question helps us to explore attitudes of SMBs towards the various marketing channels they have at their disposal. There’s also a breakdown of the effectiveness of internet marketing compared to offline marketing. Although the majority of those surveyed rate online marketing as the most effective way to attract new customers, Word of Mouth (WoM) is still considered the most effective marketing channel for many SMBs. SEO (includes Google+ Local) is clearly seen as the most effective internet marketing channel. Yet from earlier questions we can see that there is still an unwillingness to back this up with budget. After SEO, it is Local Online Directories that are seen as the most effective technique. Are SMBs also effectively tracking clicks/leads/sales from these sites? Are respondents smartly factoring in ‘citation power’ of directories in boosting Google+ ranking? This does reinforce data from the 2013 Expert Citations Survey that local data & local business listings (aka Citations) are growing in importance as a local SEO ranking factor. There is an overwhelming lack of confidence in PPC from most SMBs. We know that Google has had a hard time engaging with SMBs to purchase AdWords/AdWords Express, and from this data we can see that they may be fighting a losing battle. However, looking at the value & success SMBs get from local search visibility compared to PPC, how long will it be before Google starts charging for prominence &/or standout in local search results? Once again, we see a high amount of confidence in internet marketing from SMBs. This again raises the question of why there is a lack of budget allocated to a channel which is rated so highly. However, Pet services, Restaurants, Sport & Recreation, Business Services & Catering also have high faith in internet marketing as a lead generator – but are not necessarily dedicating much of their overall budget towards marketing (either offline or online). 6. Do you have a mobile-ready / mobile optimized website? Although over half of those surveyed do have a mobile ready site, there’s still a considerable percentage of SMBs that are yet to make this change. A 2012 study from Google showed that whilst nearly 75% of users prefer a mobile-friendly site, 96% of consumers say they’ve encountered sites that were clearly not designed for mobile devices. Indeed the same study suggested that when users visited a mobile-friendly site, 74% of people say they’re more likely to return to that site in the future. Furthermore, 67% of mobile users say that when they visit a mobile-friendly site, they’re more likely to buy a site’s product or service. More importantly for small business owners, the Local Search Association reports that the number of local searches on mobile devices quadrupled in 2012. This is clearly an opportunity which many SMBs have yet to seize upon. A large percentage of small & medium businesses identify mobile & mobile marketing as an important channel for their business. However, we’ve already established that there is still a fair amount that have yet to harness that power by investing in a mobile optimized website. From an industry perspective, it is those with a greater association to personalised marketing & local reputation that are already recognizing the power of mobile. SMBs within the Pet Services, Travel & Leisure, Health & Beauty and Personal & Household Goods sectors are those that are leading the way. An obvious theory is that that these types of businesses tend to inspire more on the spot decisions with regards to purchases, and with many of them relying on ‘passing trade’, they are ideally suited to mobile where ‘roaming’ users can search on the move. The second part explores how many SMBs currently use internet marketing consultants and / or SEO agencies and how effective these working relationships are. The majority of those surveyed prefer to handle their internet marketing in-house. As in previous questions, this may lean towards a reluctance to commit a high proportion of their marketing budget towards this channel. Alternatively, this may suggest that most small businesses owners prefer to have full control over their internet marketing rather than trusting it to an outsourcer. The search industry has more than it’s fair share of cowboy operators so maybe these SMBs have been burned in the past or are wary due to the negative experiences of others. Whatever the reasons, it is still surprising that so many SMBs handle their internet marketing in-house. Considering the amount of daily tasks that are demanded by an ongoing marketing campaign, it would seem unrealistic for every SMB to give this the due time and attention that it deserves. Not to mention the continual stream of industry updates that any internet marketer must keep abreast of. For digital marketing agencies or consultants this should present a great opportunity. If agencies can pitch their services in the right way, demonstrating their knowledge and highlighting relevant case studies (see below), then many SMBs would welcome the opportunity to free up more time in-house. In this question we looked at how many of the respondents which do outsource their internet marketing were actually satisfied with the work being carried out. 50% would describe themselves as ‘quite happy’ with their performance. 26% would describe themselves as ‘very happy’ with their performance. Of those SMBs that do work with an agency / consultant, its great news that most of them are satisfied with the services offered. Once again, if this positive work can be demonstrated to potential clients in pitches, then there’s great scope to increase that happy client base further still. The vast majority of SMBs are contacted by prospecting marketing/SEO companies on a weekly basis. Some SMBs feel hounded by these ‘customer-hungry’ agencies and find these calls irritating. A major concern for the search industry is that the over-competition among agencies drives down the cost of local search services. I’ve said this in a number of recent posts on BrightLocal & SearchEngineLand, the danger of over competition is that it leads to price competition, discounting, untenable performance promises that ultimately devalues our little industry and the service we provide. Of course, this could be construed as both a negative and a positive – on one hand it can serve as a catalyst in de-valuing the search industry in the eyes of SMBs (as previously suggested), or alternatively, increased competition means lower prices for SMBs looking to outsource. Not many small & medium businesses want to outsource their internet marketing to an expert. Is this due to lack of understanding about the tasks involved? Or perhaps it stems from reservations about the costs or previous bad experiences. Whatever the reasons, it does show that an increasing amount of small & medium businesses are learning about how to do internet marketing for themselves and are more willing to try it themselves. Perhaps a wholesale breaking down of the barriers associated with the industry – much of the perceived ‘mystery’ and ‘jargon’ – is now taking place, as well as an increased media focus on internet marketing as a more ‘mainstream’ source of attaining customers. Importantly now, agencies must demonstrate their trustworthiness and expertise in order to flourish. Good internet marketing agencies who can build a solid reputation and leverage that to win new customers will thrive and survive – others who don’t match up to those standards may ultimately fall by the wayside. Overwhelmingly, the most popular factor for small businesses when choosing an internet marketing agency or consultant is low cost. Once again, does this highlight a lack out understanding from outside the industry about the full extent of the tasks and processes involved in an internet marketing campaign? Worryingly still, almost the same percentage of small businesses say that ‘performance guarantees’ are as important as a ‘good reputation’. Does this potentially give the upper hand to SEO black hat methods? Or agencies looking to make quick gains with performance promises as opposed to a sustained strategy? For many reputable agency’s and consultants this is a potentially concerning trend. As those within the industry know, low costs can often equal short cuts, low quality work – and most damning of all – the potential to receive a penalty by resorting to quick & dirty tactics. However, as discussed in the previous analysis, increased competition within the industry may now drive down prices ensuring a better deal for SMBs across the board – without a compromise on quality. The fact that a good reputation is still quoted as one of the most important factors can only be good for internet marketing agencies. If they have a good reputation then this is something that needs to be leveraged in order to contact, pitch and win more SMB clients. This is turn could even help agencies to avoid having to lower their costs – as a good reputation ultimately means less risk for clients, which in turn equals more SMBs willing to pay ‘the going rate’ – allowing the agency to continue doing what they do best. We know that internet marketing and SEO companies are contacting SMB businesses on a weekly basis – so maybe it’s just that they’re not focusing on communicating the right message? This subject is a clear divider of opinions. Perhaps due to a perceived lack of communication from Google on the subject or the constant changes being made to the service. When we collate the positive responses with those which are more negative we can see from the chart above that there is generally a negative feeling on the subject. Perhaps this underlines the fact that small & medium businesses need more assistance or information on the subject of Local SEO. In turn, this does represent a good opportunity for search agencies & consultants. It gives them the chance to pitch for management of Google Places & other Local SEO services – leaving the client free to focus on running their own business.